Frank. 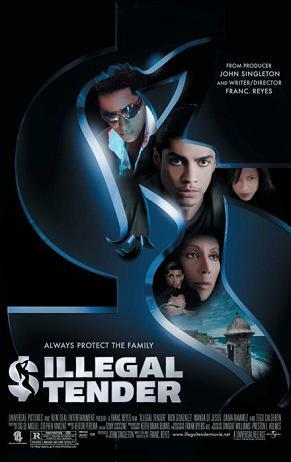 Reyes writes and directs Illegal Tender about Millie (Wanda De Jesús), a mother who tries to protect her son, Wilson DeLeon, Jr (Rick Gonzalez), from the ruthless gang that murdered his father years ago. After coming from the dance choreography field, Frank. Reyes (no, the period in his first name is not a typo) has previously written and directed Empire starring John Leguizamo. I had the privilege to interview him. Universal Pictures releases Illegal Tender on August 24th, 2007. NYC MOVIE GURU: How close to you was the story in Illegal Tender? FR: This type of story is not unfamiliar to me—I grew up in the South Bronx. I just needed to spin that yarn in a way that’s interesting to watch. NYC MOVIE GURU: Were any of the characters in Illegal Tender based on someone from your life? FR: I didn’t grow up with a single mom, so it didn’t come from that experience. When you sit down, these characters become a combination of a bunch of different people, some from your own experiences and some that you better not talk about. NYC MOVIE GURU: What’s so special about Wanda’s character? FR: The idea that she’s a real woman—a lioness protecting her cubs. I don’t think you see many women characters doing that [in movies] period, not since Gena Rowlands in Gloria. NYC MOVIE GURU: How did you know how far to go with the violence? FR: To me, the violence was just a part of the story. I don’t shy away from that stuff at all, especially when it’s coming from a violent place. Maybe, maybe a hot dog is more American than violence. But if I stuck a hot dog there, I don’t think it would have mattered. NYC MOVIE GURU: What was the best part of making Illegal Tender? FR: I think what one of the best experiences I’ve had making Illegal Tender was auditioning amazing Latino talent. It just shows that there needs to be more of us and to make Latinos protagonists. NYC MOVIE GURU: How did you learn the art of filmmaking? NYC MOVIE GURU: Do you think Illegal Tender will push the Latino movement in cinema? FR: People always talk about this “Latino explosion” that’s supposed to happen. I just don’t believe that that would happen until there’s an implosion first. Latinos, ultimately, need to recognize that they can do whatever they want to do. The “explosions” that have happened have always been on the surface; there’s no real meat to it. I’m not saying that Ricky Martin, J-Lo or Marc Anthony are not important. They’re very important, but that’s all there is. When that’s all there is, that mean’s there was no depth to that experience. For instance, when you have Spike Lee do a film, twenty filmmakers came after him. That wasn’t the case when Robert Rodriguez did Desperado. There needs to be awareness, a real renaissance, within the Latinos themselves. When that happens, then we will see [the “Latino explosion] for real. ing that was a book which [is] about what’s happening now in the Middle East. [It’s] a complete understanding of what’s going on and how we’re dealing with it. It’s [written] by a journalist called David Ignatius. It was called Penetration which I think is a really good title, but that’ll change by the time it comes out next March.